We just received notice that the BLM has suspended construction of some of the the Ivanpah Solar Thermal Power Plant due to the project reaching its upper limit number of tortoise killed for the Biological Opinion and incidental take limits established in approving the project. The commitment announced Monday is part of the financing that BrightSource Energy needs to build a solar power plant in California’s Mojave Desert. A BrightSource contractor working on the Ivanpah Solar Electric Generating Station in California’s Mojave Desert kills a Mojave yucca (Yucca schidigera) that was likely between 400-800 years old. The Bureau of Land Management has increased the estimate of how many desert tortoises will be displaced by the Ivanpah solar plant in southern California just southwest of Las Vegas. The previous estimate was that there would only be 32-38 tortoises displaced by the development. They now estimate that there will be 140 of the endangered tortoises displaced by the 5.6 square mile development. The new estimate has required the BLM to seek new consultations with the US Fish and Wildlife Service. Previous attempts at moving tortoises to new locations have resulted in half of the tortoises dying and similar number of resident tortoises dying at the relocation site due to displacement. If this relocation effort has similar results then it would result in 140 dead tortoises. Tortoises are long living creatures that mature at age 15 and can live up to 80 years or more. They have declined by as much as 90% since the 1980’s due to habitat destruction and increased predation by ravens which thrive in areas where they previously didn’t because of human trash and livestock which die or leave birthing materials in the spring. They also are illegally collected by people who want them as pets. Land development, such as BrightSource’s Ivanpah solar plant, are also becoming threats to their survival. Ivanpah solar project could displace 140 tortoises. Energy development poses challenge to wildlife habitat. By Larry Johnson. Las Vegas Review-Journal. And unsaid is the continuing bad idea of centralized energy generation, even if it is said to be renewable. For several months we’ve been covering the progress of the, now approved, solar power plant at Ivanpah near Las Vegas on the California side of the Nevada/California border. Initial construction has begun and biologists have rounded up as many desert tortoises as they can to prepare the site for what essentially amounts to sterilization. In past studies where desert tortoises had been moved, half of them died while an equal number of tortoises at the site where they were moved to were subsequently displaced and died. 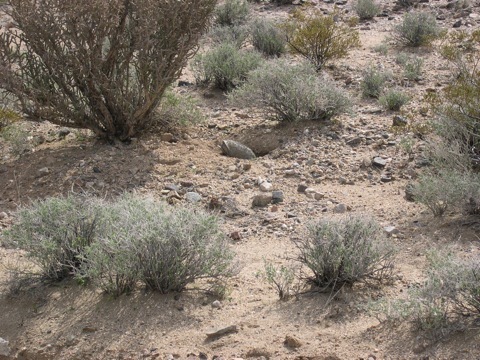 The energy company BrightSource Energy says that they want to mitigate the loss of the desert tortoise by restoring Castle Mountain Venture land and mining claims in an area to the north and add them to the Mojave National Preserve. This is all well and good but the lands are very poor desert tortoise habitat and would not compensate for the habitat lost due to the destruction that the new solar plant will cause. It’s hard to call a project like this “green” when there is no corresponding reduction in greenhouse gas emitting coal or natural gas power plants and when the habitat destruction being caused further imperils the endangered desert tortoise and other species. This project keeps power generation in the hands of big corporations at the expense of taxpayers who would benefit more from subsidized use of less environmentally damaging rooftop solar.